Great transport connection of 7 Days Premium Hotel Salzburg - located just off the A10 motorway with close proximity to the city centre of Salzburg. Underground parking and special spaces for women, own bakery Ketter & summer terrace. Breakfast is for an extra charge. Pet under 20kg is welcome for an extra charge. All 100 modern & soundproofed rooms designed in fresh colours are with double bed and full-size bunk bed above. Rooms are equipped with free Wi-Fi, adjustable air-conditioning, private bathroom with shower and cable flatscreen TV. 7 Days Premium Salzburg is located just off the A10 motorway & only 15-minute drive from the city centre of Salzburg. Salzburg Airport - 15 minutes drive from the hotel. Salzburg Main Train Station - 20-minute drive from the hotel. Red Bull Arena - 10 minutes drive from the hotel. Taxes not included - city tax 0.75 EUR per person per night. Breakfast not included - 8.00 EUR per person per day. Pet friendly. Pet under 20kg for an extra charge. I rented a private. 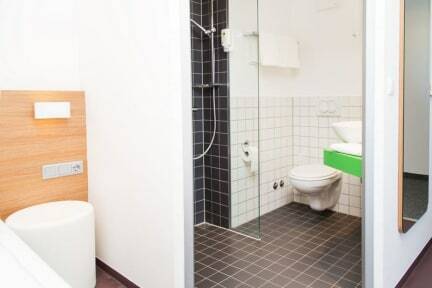 It was clean and modern, with a spacious and modern bathroom as well. The breakfast was generous and lounge area decent. Located outside of downtown so more ideal for those with vehicles or on a group tour. Hosts were helpful. And bonus, a very pleasant view from my window. Highly recommended! The hotel is situated at a remote location. public transportation is well connected but you have to walk a mile to reach nearby bus station or Bahnhof. since lunch and dinner are not provided by the hotel you have to be prepared for that. there aren't many options for dinner around the hotel as it is in a remote place. If hotel staff could be more informative we would have enjoyed our stay even more happily. we find the hotel as well maintained and clean, perfect for staying. happy with overall.